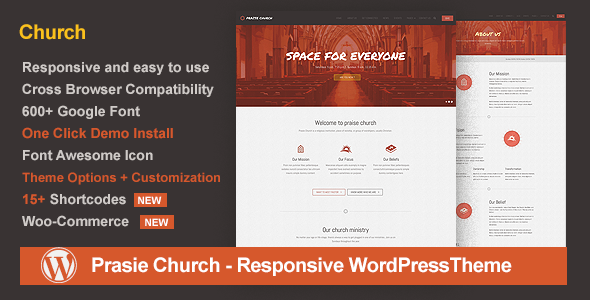 Praise Church Wordpress theme is a fully responsive, Retina-Ready WordPress theme with a minimal, clean design that allows visitors to focus on content. Praise Church Wordpress Pages like Church Campus, Giving page, About us, Paypal Donation Form, Volunteer form, Prayer & Worship form, Visitor form, Contact form, Ministry, Pastor, Sermon, Event, Gallery, Slider, FAQ's also 404 Error. - Custom Post Formats -Praise Church supports following custom blog post formats: Standard, Gallery, Link, Quote, Video, Audio etc. ADDED : All Page and Post Meta Added For Where to Show Sidebar ( Left, Right, None ) and Select Sidebar ( Primary Sidebar, Secondary Sidebar, etc. ). High Resolution: Yes; Widget Ready: Yes; Compatible Browsers: IE8, IE9, IE10, IE11, Firefox, Safari, Opera, Chrome; Compatible With: WPML, WooCommerce 2.6.x, WooCommerce 2.5, Bootstrap 3.x; Framework: Underscores; Software Version: WordPress 4.8.x, WordPress 4.7.x, WordPress 4.6.1, WordPress 4.6, WordPress 4.5.x, WordPress 4.5.2, WordPress 4.5.1, WordPress 4.5; ThemeForest Files Included: PHP Files, CSS Files, JS Files; Columns: 4+; Documentation: Well Documented; Layout: Responsive. FixPress - Repairing WordPress Theme; Cathedral - Multi-Purpose Church WordPress Theme; Arczone - Architecture Business WordPress Theme; Repair Shop - Mobile & Gadget Repairing HTML Template; Church - HTML Template is built for church; Repair Shop - Mobile & Gadget Repairing PSD Template; Air conditioner & HVAC Repair WordPress theme. Keywords: Causes, charity, christian, church, churches, donation, event, ministry, non-profit, pastor, religion, religious, responsive, sermon, small business.